"One of the primary goals of all Takeo Ryu students should be the ability to execute techniques without thinking, should the need arise. Also, students should know that only repetitive practice will make this second nature. During class, face to face practice is the only means to accomplish proficiency and realism. Following the principles of Takeo Ryu training, students should learn that if an attempted technique does not seem to be working, another technique should automatically be entered into. Techniques are the means to the goal of taking your attackers to the ground and destroying them. The techniques taught in Takeo Ryu are very harsh - but remember - When you show kindness to your attackers, you are being cruel to yourself." "LEARN HOW TO PROCTECT YOURSELF AND YOUR LOVED ONES!" When facing an attacker, stay slightly to one side of the attack line. Move back and forth across the attack line, or employ circular motion to off set his attack. Any time a technique is not lined up with your center line, power loss occurs. The closer you can keep your techniques to your centerline, the more powerful and effortless they become. Always use combinations when you attack. One strike or defensive move and counter-attack are not likely to end the fight. Think beyond your first move. Your determination may be the deciding factor between success and failure. An aggressive mind-set will more often than not help save your life. Power is derived from several sources working in harmony toward a common goal. Balance is an element of power. Always center your upper body over the foundation of your lower body and project all energy in the same direction. In a deadly threat situation, involving you, family members or friends, it is imperative that you gain control and end the confrontation as quickly as possible. Use techniques that will do the most amount of damage in the fewest number of moves. When you waste time you allow your attacker additional time, giving him a position of strength. Start with the least amount of force necessary to control the threat. When you decide to go ahead with your attack, pursue it with full force and intent. Quite often I have said this during class — <><><><><><><><><><><><><><><><><><><><><><><><><><> "When you show mercy to your attacker, you are being cruel to yourself'. <><><><><><><><><><><><><><><><><><><><><><><><><><> Never assume the fight is over because you nailed the attacker with one good strike. Know that the threat may not be over. You may need to escalate the force; and if it is a matter of life and death — you may need to take a more lethal approach. In Takeo-ryu, you hurt to keep from being hurt - you maim to keep from being maimed and you kill to keep from being killed. 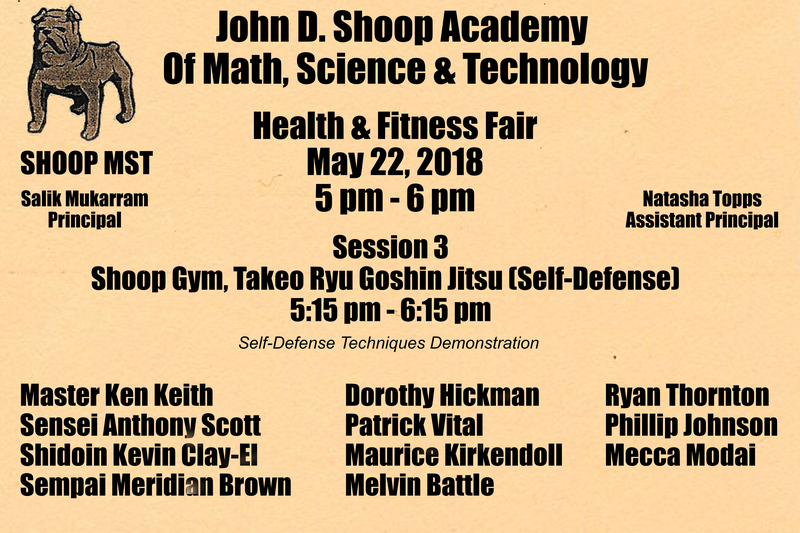 Click > Shoop School Demonstration Doc.